It can be converted from road to adventure/off-road spec via its quickly detachable visor and rapidly attached peak and goggles. As such, the Explorer-R suits lots of different types of riding and is appropriate for the broad range of bikes I test. I’m on my third one, and I absolutely love it! To be honest, I wasn’t sure I’d get on with the SHARK to begin with. Having quite of bit of experience of riding on both the road and dirt, I reckoned a helmet claiming to be suitable for both bike disciplines was a boast too far. But for the umpteenth time in my life, I had to admit I was wrong! The first time I wore the Explore-R was for a dual purpose tyre test on the roads and trails of Wales back in 2014. It managed that role well enough, but I discarded it for a while until I used it again for a much bigger test of its abilities – a long ride down to, and then through the Italian Alps along a selection of mountain trails. It was a mega on/off road trip lasting 10 days and covering over 2200 miles. The light and stylish SHARK turned out to be perfect in just about every way. For starters, it’s totally comfortable with its well-made interior feeling soft against the skin. Along with an excellent fit, even 12-hour riding days brought no complaints. 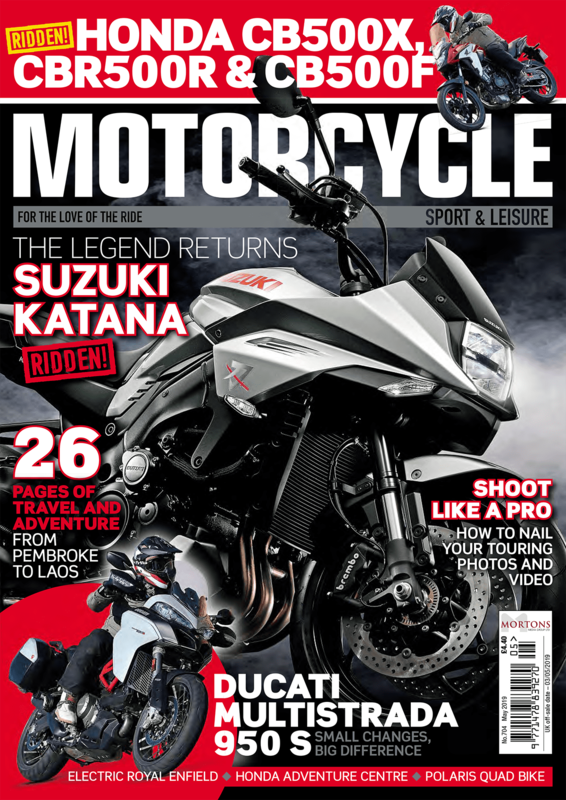 And though its peak is designed for protection rather than aerodynamics, I never felt the need to remove it – though that can be done in a jiff – even when cruising on an unfaired bike at 80mph for hundreds of miles. The wide aperture helps vision, and thanks to the goggles fitting very snugly within this, there’s little wind noise. Despite the good seal, the anti-mist lens always guarantees clear vision. Given that I rode in temperatures ranging from 5-35°C, sometimes getting a bit sweaty when riding off-road in the Italian heat, I can claim that with some authority. Not letting anything nasty like cold draughts or dirt get through is another welcome bonus. I expected the quick release goggle strap might be tricky to master, but ever since my first day in Wales it became instinctive to use. It’s one of the most useful features of the helmet for me. 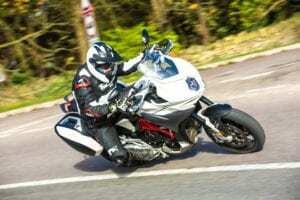 When I’m riding, especially off-road, whenever there’s a need to whip off the helmet quickly, it can be undone and re-done safely without even removing my gloves. I regularly consider it a godsend. You can swap the goggles for a visor, but I’m often happy to stay with them. In the warmth of Italy, I did store them away a few times while I just used the drop down sun visor when road riding to enjoy some extra ventilation. The visor is another great plus point for me. To be able to instantly cope with changing light conditions has proved massively convenient. I can also testify to the quality of the anti-scratch and anti-fog visor. It’s very durable. Since the Italian adventure, I’ve grown to appreciate the Explore-R all the more. The carbon aramid fibre and glassfibre shell on the “Carbon Skin” model I wear gives it a very sturdy and protective feel, but the materials also give it a lightness that adds to the overall comfort. There are five other composite fibre decals to choose from in sizes XS to XL. Given SHARK Helmets are used by racers such as Jorge Lorenzo, Johann Zarco and Sam Lowes, my faith in their protective qualities is really heightened. I’ve never removed the machine-washable lining to give it a clean, which is shameful I know! But it’s good to know it can be done. I’ve also never tried the enclosed anti-draft chin bib which can keep the cold away from your face in winter, the Sharktooth® communication system which allows you to keep in touch while riding, or the Easy Fit system that makes wearing glasses more comfortable. Those features are a reminder of the Explore-R’s very detailed and thoughtful design, and underline why I rate it so highly. It’s a hell of a lot more than just an excellent form of head protection. 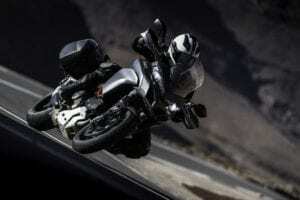 Light and stylish with aggressive looks, the Spartan is aimed at the sport touring rider who needs comfort and convenience as well as protection. Two shell sizes give a range of six sizes from XS to XXL, with the composite fiber shell featuring dual spoilers for stability and vents to keep cool. The plush removable lining is machine washable, and helps to give a good, comfortable fit. The anti-scratch visor is easy to remove for cleaning and an integrated sun visor features stepless adjustment. A Pinlock anti-mist visor is also included. The Spartan is Sharktooth® compatible, with its Easy Fit system making wearing glasses more comfortable. The ability of the EVO-ONE 2 to be converted from a full face to an open face jet style helmet offers real versatility. As the chin bar can be hinged around to the rear of the helmet, both safety and aerodynamics are boosted. The Evo-One 2 is an evolution of the successful original. Its vented thermo plastic shell comes in two sizes giving a range of sizes from XS to XL. 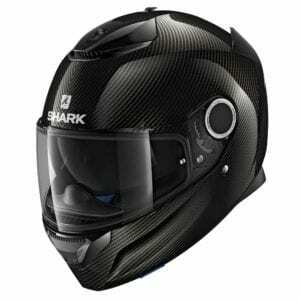 Secured using the highly convenient fastening straps, the SHARK also features a removable machine-washable lining, a stepless drop down sun visor, and anti-scratch visor. An anti-mist Pinlock visor is included too. 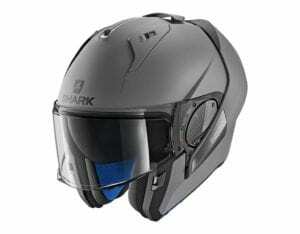 Turn heads as well as protecting your own with the super stylish SHARK Helmets S-Drak. Available in a choice of striking colourways with premium finishes, the S-Drak is the first choice of the streetbiking set. 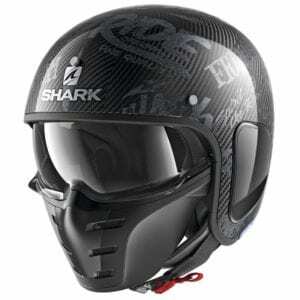 There’s much more to it than show of course, with the 1000g carbon fibre helmet offering approved levels of protection. It comes in two shell sizes to offer the best fit from its six different sizes (XS to XXL). Both the internal drop down visor and facemask are easily removable without tools. The S-Drak is Sharktooth® compatible, features the Easy Fit system to allow comfortable spectacle wearing, and its lining can be machine washed.